Happy Sunday! Grab your coffee (or tea) and mixing bowls, you’ve got some donut making to do. Actually, scratch that. There’s no rush. These beauties can be made in thirty minutes, just in time for brunch. Although sugary sweet, orange adds a subtle tartness. Definitely a mouth-watering addition to 12 Days of Christmas Recipes. If you’re new to the game of donut making, I am right there with you. I actually just purchased my first donut pan (pictured above). It’s an investment I’m pleased with and highly suggest! Now I can make these and other morsels whenever I please. For 12 Days of Christmas recipes, I knew donuts would be included but was unsure about the flavor. Chocolate, jelly, cinnamon-sugar, toasted coconut?! There’s so many options. Nonetheless, Cranberry Orange is a Christmas combination I didn’t want to leave out. Enjoy, and let me know how they turn out! To start, preheat your oven to 350 degrees and grease a donut pan. Into a small bowl, add your flax meal and water. Set aside for 5-10 minutes. In a medium bowl make your buttermilk by combining soy milk and apple cider vinegar. Whisk and then set aside to let curdle. After a few minutes add apple sauce, vanilla extract, orange juice, cane sugar, orange zest, and orange juice. In a large bowl, combine flour, baking powder, nutmeg, and salt. Combine your wet ingredients and flax mixture into your dry ingredients. Mix for 30-45 seconds and then add in dried cranberries. Grab your donut pan and fill ¾ full. If you fill to the line, they won’t look like donuts (trust me). Bake until golden brown and a toothpick inserted comes out clean, about 18-20 minutes. Let the donuts cool for 5 minutes before transferring them to a wire rack. Repeat this process with remainder of batter. For the glaze, whisk together powdered sugar and orange juice until smooth. To avoid a glazey mess, place wax or parchment paper under your wire rack. Dip each donut into the glaze and place back on wire rack. 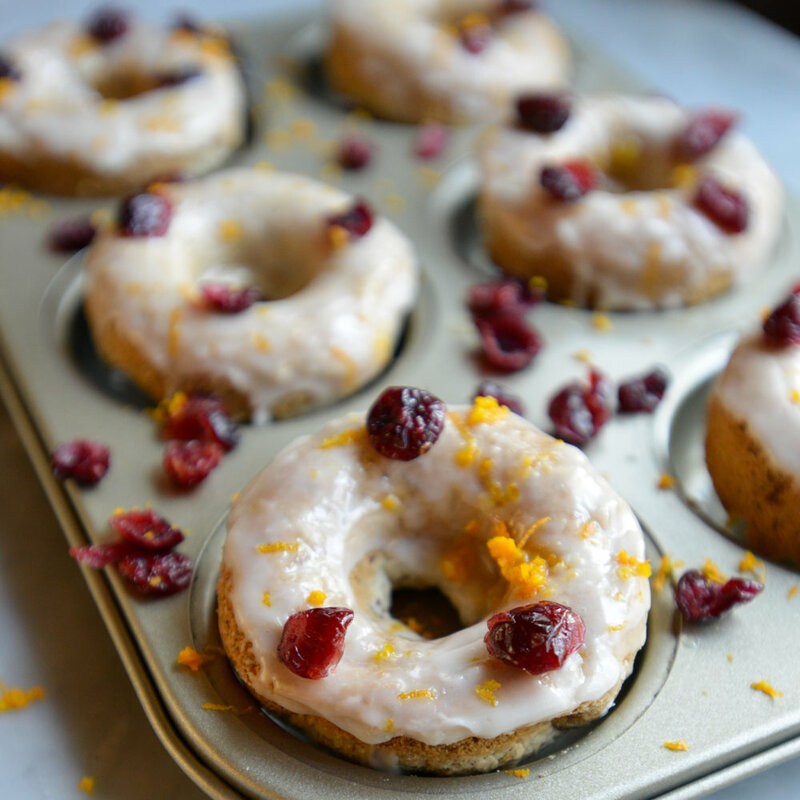 Grate orange zest onto the donuts and top with extra dried cranberries.